This was GE's attempt at a very simple direct-read meter. On the back there's a table and you pick your film and shutter speeds, and that tells you which scale to use. 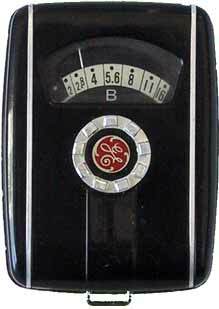 On the front, you turn the little thumb-dial (with the GE logo) until the proper scale shows up, and then you point and the meter tells you which ƒ-stop to use. Great meter for movies where the shutter speed is fixed and you're always shooting the same film speed (at least on that spool). It's less great on a camera, but if you have a simple camera with full manual control like my Kodak Stereo, this is quick and easy to use and no fuss. It's also very small and light, so it can easily live in a shirt pocket and would make a nice backup meter in case the main unit fails.